A heart shaped Swarovski crystal set in Medical Plastic. Medical plastic contains 0% Nickel. Even those with severe nickel allergy can wear Medical Plastic all day comfortably. The entire setting is 6mm. As always, our earrings are sold by the pair with backs and come in a Clean Pack. 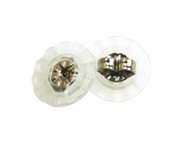 In the transparent Clean Pack bubble, one pair of earrings are hygienically packed. The label is a seal which guarantees that you are the first person to wear your new earrings. I bought these for my daughter. Her ears never healed properly from piercing at a jewelry store 8 months ago. She’s delighted with these earrings and her ears are finally healing. She loves the sparkly pink hearts. Purchased these adorable heart earrings for my 5 year old. I have tried everything for her sensitive ears ( sterling silver, gold) and none of it has worked, this was our last option and we were going to let the holes close up if these earrings didn’t work. After a day or two of wearing these earrings, my daughters ears look better than they ever have before! Definitely recommend. The only thing I don’t like is paying $30 for one pair of kids earrings. This is my daughter’s first pair of ear rings after getting her ears pierced. She loves them. They are easy to put in and take out. Perfect size! I bought these for my daughter's birthday and she loves it. This is her 2nd pair. I will definitely buy more! These earrings are the absolute best! We got my daughters ears pierced when she was 5 months old. These are the only earrings she has ever worn. The backs are safe and they are perfect size for her. She is now 11 months old and we just bought her these adorable heart ones and they are perfect size for her ear. These earrings are high quality and worth price if someone in your family has an allergy to metal. My daughter gets cysts in her ears no matter what quality gold earrings we purchase including those that state they are nickel free. These are a great alternative. I purchased these for my daughter as a gift. They are petite and are sparkly! She will love them.